TWU gymnasts meet with Division 1 gymnastics teams in the NCAA. The 2016 Gymnastics season began at home Jan. 8. The Pioneers competed with Florida, a Division 1 school ranked No. 2 on the National Collegiate Athletic Association website. The Pioneers accumulated a score of 191.450 in performance while Florida maintained a 196.825. Highlights included the large attendance, despite the lack of student presence on campus, and a student athlete success. A crowd of 780 gathered in the Kitty Magee Arena for the opening meet with Florida. 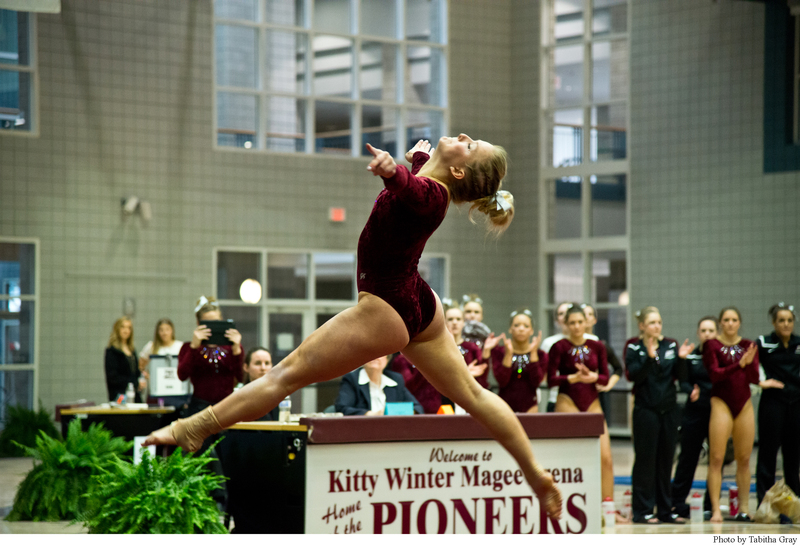 According to TWU Athletics, sophomore Taylor Vincent excelled on her beam performance with score of 9.825 and was awarded the title of Midwest Independent Conference Co-Specialist of the Week. In the next competition, a tri-meet against No. 4 Oklahoma and No. 11 California, the Pioneers scored third and last with a cumulative score of 188.250. They improved their statistics at the next meet against No. 10 Arizona with a posted score of 192.450, coming in behind the competing team. This semester, the TWU Gymnastics team has 14 athletes on the team, 12 whom are first-years or sophomores either competing for the first time at this level or still gaining experience at meets. Bowerman stated: “We are really putting a focus on overall performance and presence.” She claims that clean landings and presence can make a difference in collegiate gymnastics and that, as the athletes gain more experience on the floor during meets, they will build up on difficulty in order to improve. The TWU Pioneers had a quad meet at home in the Kitty Magee Arena, Jan. 24, where they scored second. Southeast Missouri State earned the title with a score of 191.900, while the Pioneer’s score was close at 191.600. According to TWU Athletics the Pioneers had a mixed performance on beam and the floor and will have a short week to train on landings.